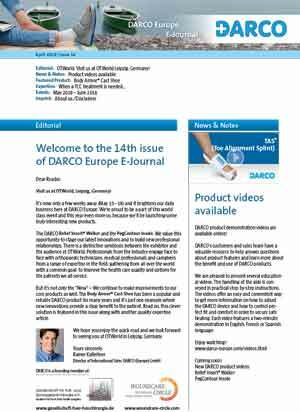 Released every quarter, the DARCO eJournal informs you on interesting product developments, background information, meetings and procedures that focus on foot care. 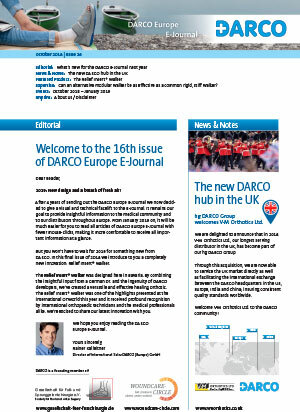 The DARCO Europe E-Journal now has a new look and feel. We know your time is valuable and so we’ve created a new and easier format for you to get the information that matters most to you with only a few clicks. In addition to our traditional “News and Notes” this month, you’ll also get a bird’s eye view on our R&D team here in Germany and a special gift for our E-Journal readers. It is our goal to produce a worthwhile, informative E-Journal every quarter. 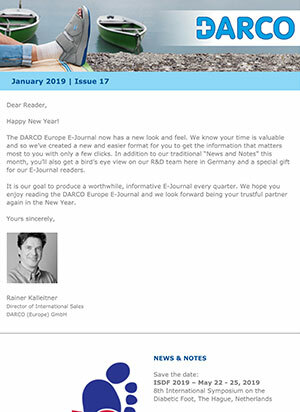 We hope you enjoy reading the DARCO Europe E-Journal and we look forward to being your trustful partner again in the New Year. The E-Journal is now web-based. Please view it at the link below. Our 16th issue of the DARCO Europe E-Journal is dedicated to the Relief Insert® Walker, which was one of the highlights presented at the international OTWorld this year and it received profound recognition by international orthopaedic technicians and the medical professionals alike. We’re excited to share our latest innovation with you. 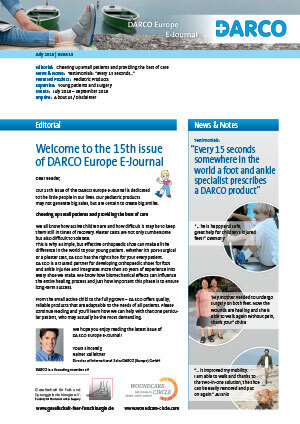 Our 15th issue of the DARCO Europe E-Journal is dedicated to the little people in our lives. Our paediatric products are becoming increasingly popular. 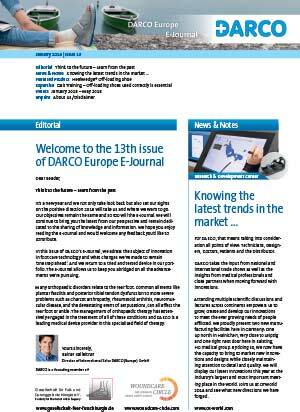 The DARCO E-Journal quarterly publication is designed to provide insightful information to our associates in the medical community, professional institutions and to our distributors throughout Europe. We hope that you enjoy reading the latest edition. It’s a new year offering us opportunity to reflect on what we have achieved but also set our sights on 2018 and where this will take us and where we want to go. Our objectives remain the same and so too will the E-Journal. We will continue to bring you the latest from our perspective and remain dedicated to the sharing of knowledge and information. We hope you enjoy reading the E-Journal and would welcome any feedback you’d like to contribute. In this issue of DARCO’s E-Journal, we address the subject of innovation in foot care technology and what changes we’ve made to remain “one step ahead”. We also return to a tried and tested device in our portfolio. The E-Journal allows us to keep you informed on all the advancements we’re pursuing. Many orthopaedic disorders relate to the rear foot. Common ailments like plantar fasciitis and posterior tibial tendon dysfunction to more severe problems such as Charcot arthropathy, rheumatoid arthritis, neuromuscular disease, and the devastating event of amputations, can all affect the rear foot or ankle. The management of orthopaedic therapy has extensively engaged in the treatment of all of these conditions and DARCO is a leading medical device provider in this specialised field of therapy.